Seamlessly transfer student, parent/adult, and emergency contact, and attendance data recorded in our childcare and camp management software, EZChildTrack, to the EZReports software. Automated data transfer from EZChildTrack to EZReports is meant for clients who are running both fee-based and grant-funded childcare/afterschool programs. EZReports software helps clients manage and conduct reporting for their grant-funded programs while EZChildTrack enables clients to automate their billing process, accept online payments, and provide a customizable online registration form for parents. 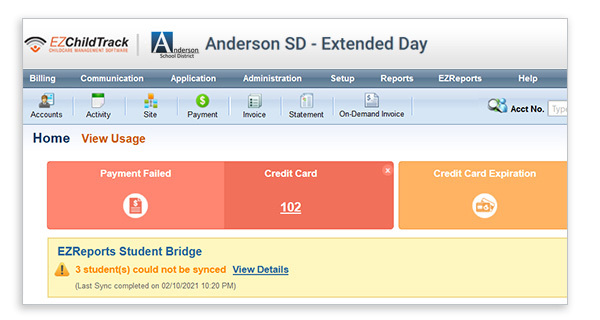 EZReports works with EZChildTrack to provide an integrated and comprehensive solution for your afterschool needs. Please visit our EZChildTrack website for more information on this product.